I am just back from participating in the annual membership meeting for the Foundations for Peace (http://foundationsforpeace.com/). One of the members hosted the meeting in their home country of Indonesia making it a great opportunity to learn about another country’s context while reconnecting with my colleagues. While it is always difficult for me to get away from my day to day work to travel, the meeting was well worth the effort. The Foundations for Peace is a small network of indigenous organizations based in conflict affected countries. All of the member organizations work to strengthen community philanthropy as the means to develop a strong civil society and strive for social justice amidst the conflict. One of the main areas of discussion included the diminishing donor resources to support the type of work that we are all doing in our home countries and the need to create alternatives to the current aid paradigm. Several of the organizations, including Dalia Association, are developing their solidarity economy programs in order to generate funds to support our work. Many of us are also developing diaspora and solidarity alternative tourism and volunteer programs to bring supporters to our countries. It was really refreshing to be a part of a conversation which is focusing on creating successful alternatives to mobilize resources rather than focus on the current Big Aid system and trying to convince it to change. We agreed to continue these conversations and experiments in the months to come as we prepare for our next members meeting in September 2018. 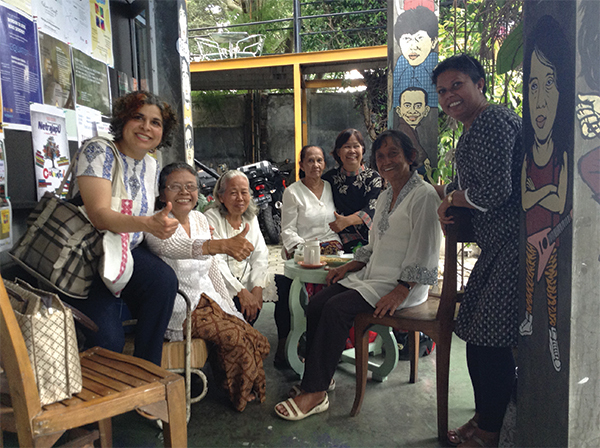 A highlight of the meeting was getting to know a little about Indonesia. I have to admit that I am ignorant on Indonesia’s history. However, the first day of the three day meeting focused on raising awareness about the country in general and in particular, about the 1965/1966 mass killings that occurred in Indonesia. A local professor/priest provided a historical account and several women survivors provided their personal accounts of this tragedy. Based on my personal evaluation, the mass killings were aimed at members of the communist party as the propaganda personified such individuals as anti-religion. Coincidentally, this tragedy occurred as the parliament was attempting to re-distribute land ownership from a few to the many. As I always say, it is all about the resources. Land. Energy. Water. Food. These are natural resources that should support the indigenous peoples to live a life of abundance and dignity. It is the right of the people to control their resources, respect its limits, and use these resources to support their communities. At Dalia, we believe in our right as Palestinians to control our national resources. We also believe that it is the right of our community, our fellow Palestinians, to use our national resources for our priorities and the common good. We held another meeting with the students of the Ramallah Friends School on environmental solutions particularly sound pollution. We also held a debate on effective and successful voting procedures. including the role of the facilitator and how to facilitate meetings and group work, how to address group dynamics, and develop a responsibility matrix. The same training was also offered at the Ramallah Friends School. We met with the women funds in Salfit and Jenin. The meeting included a discussion on Dalia's programs, and methods of community giving, and mobilizing local resources for a durable development. Over the next few months, we will be implementing Dalia’s training curriculum for the members of the women funds. The topics will include the active role of women in mobilizing local resources, exchange of knowledge and expertise, and designing projects and initiatives that benefit their communities. At Dalia, we encourage women to establish women funds to allocate their resources towards their own needs and priorities. These funds are 100% women controlled, thus they serve to empower women in decision-making, and governance. There are currently 5 established women funds including; Salfit Women Fund, Jericho Women Fund, Ramallah Women Fund, Tulkarem Women Fund, and Jenin Women Fund. The members include different women cooperatives from villages, cities and towns in these governorates. We organized a Mujawara titled DIY (Do it yourself). 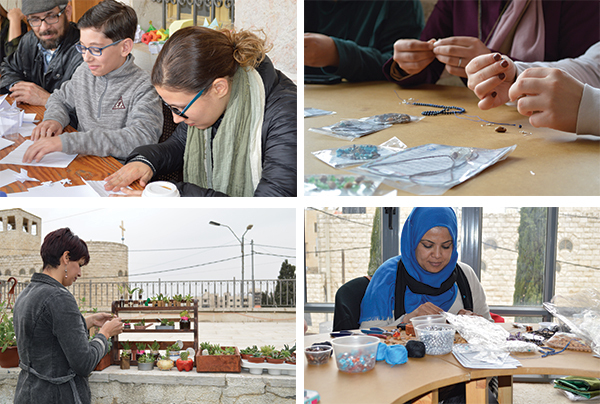 Mujawarat are ideas shared freely among community members (according to Munir Fasheh) and through different Mujawarat, Dalia is attempting to create space for the community to have a dialogue on issues and matters that concern us as Palestinians. In this Mujawara, we wanted to create items from local resources with our own hands. Hanna volunteered to teach us how to make origami. Zeinab volunteered to show us how to make earnings and bracelets from local resources such as olive seeds and date pits. Iman volunteered to show us how to reuse items from our kitchen to pot plants and cacti, such as sardine cans, and baby food jars. The Alumni from the AMIDEAST’s programs Access and Yes, held a PlayStation Fifa Cup tournament in an effort to raise money for Dalia’s community controlled programs. This initiative is part of Dalia’s new Fun-raising toolkit, which we recently launched to help friends of Dalia raise money for our programs and activities. It’s a fun-raising toolkit, not a fund-raising toolkit because the key is to have fun. In preparation of the opening of Dukkan in the next month, many volunteers and donors have pitched in to help us open the Dukkan in the Khalil Al Sakakini Cultural Center. The Hakawati Youth Group from Al Bireh, and the students of Al Najah University helped us sort the donations. Dukkan-second hand shop, is Dalia’s effort to make effective use of the resources available in our country, and to decrease waste going to landfills, thus decreasing pollution. The shop also increases access of needed goods at a budget price, so that everyone in our community can purchase what they need. This generates income for the Dalia Association, and increases the number of our community-controlled grants, so that more people in our community can benefit from these grants, therefore decreasing our dependence on external resources. The initiative embodies the concept of community philanthropy; as there are no donors and beneficiaries, rather everyone is a donor. 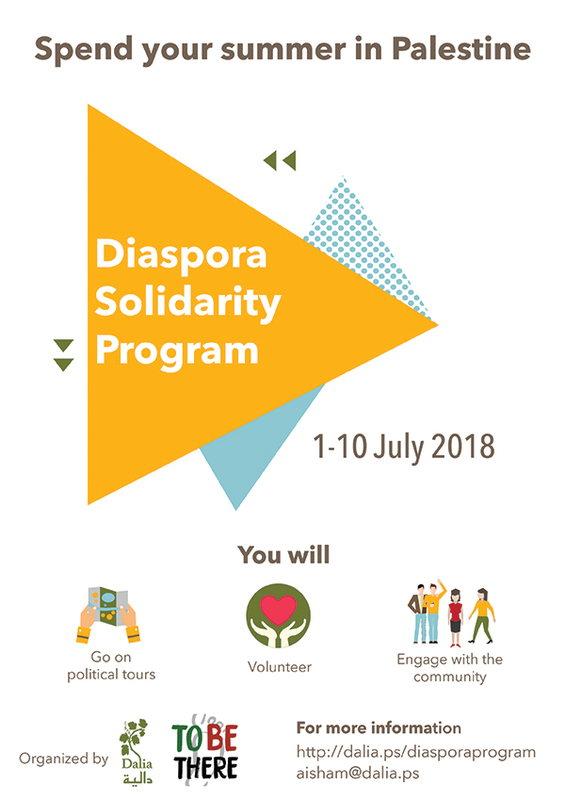 Join the Diaspora Solidarity Program!